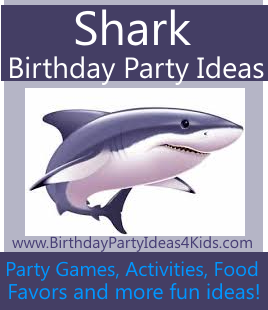 Shark Birthday Party Ideas for kids parties. Use these fun and easy ideas for shark themed games, activities, decorations, invitations, favors, food and a lot more to make your next party something everyone remembers. Print out party information and details onto note cards and then at one of the corners of the card cut out a shark shaped bite so it looks like a shark took a bite out of the invitation. On white note cards glue a piece of blue tissue paper on the bottom 2/3 of the cards to look like water. Cut out grey shark fins and place them at the top of the water. Decorate the mailbox with blue streamers and attach a large shark fin made with grey poster board so it looks like there is a shark swimming around the mailbox - you can also do this with the trees and bushes that are in front of the party venue. Place sand and seashells on the walkway to the party. On the front door hang a large sign (like you see on the beach) made from poster board that says "No Swimming!" or "Beach Closed Due to Sharks" with a picture of a large shark underneath. Hang light blue and dark blue strips of crepe paper from the entrance so guests will have to walk through the paper - you could also use long strings of blue beads. To make the party look like it is underwater fill blue and white balloons with helium and instead of tying them down let them rest on the ceiling. Attach curling ribbon to some of the balloons and at different heights tie on paper sharks or other sea creatures to make it look like they are swimming. To make waves or to cover a wall in water use yards of tulle in different shades of blue - attach at the top of the wall with Command brand hooks or attach a string from one wall to the opposite wall and drape the tulle over the string. Decorate the party table with blue tablecloths and green, white or dark blue plates, flatware, cups and napkins. In the middle of the table attach shark fins so it looks like the sharks are circling the water under the table. Teams use only the paper island pieces to hop across the water and not be eaten by a shark. Cut out five large shapes out of green poster board - these are the islands. The kids will have to use the islands to avoid the sharks in the water. The object is to get the whole group across the ocean and back using the island pieces. The group puts the island pieces in the ocean in a straight line and each player stands on one of the pieces (give them 1 more island then the total number of kids playing) then the piece is passed towards the front of the line and they all start moving forward together and then process repeats until they have made it across the "ocean" . Play as a group or split them up into teams and play as a relay race. Kids love to play tag games (one person is "it" and if they touch or tag another person then that person becomes "it") and there are many variations that adapt to a Shark party theme. Use sheets of art paper and cut out large shark fin shapes. Lay about 5 down on the ground of the play area - these are the bases. The children can stand on the bases for 5 seconds and not be tagged by the person who is "it". 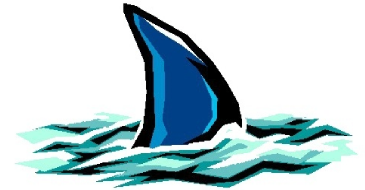 When a child gets tagged by the shark ("it") they must freeze until they are unfrozen by another player. When “it” freezes everyone they get to pick the next shark. If you are having the party at a pool see our pool games page. Shark fin cupcakes - bake and frost cupcakes with blue icing. Roll out blue fruit rollups and cut out shark fin shapes. Place the fin standing up in the middle of the cupcake. Lots of food can be cut into triangle shapes (shark fins!) ... tortillas chips, quesadillas, triangle cheese crackers, slices of cheese cut in half, pizza, etc. Sand pails - wrap up party favors in blue tulle and tie with a ribbon - then place in the pails. Blue paper bags - cut a gray shark fin and attach to the top of the bag with hot glue.